GunsGunsGuns.net grew from a simple question prompted by a visit to CNET.com, the Internet’s premier destination for anyone shopping for consumer electronics: Is there a site like this for the firearms industry? There wasn‘t, so we got to work building one. Just as CNET does for consumer electronics, GunsGunsGuns.net provides its visitors with independent, unbiased gun reviews and ratings; thorough gun descriptions, photos and specs; reader gun ratings and comments; and, when possible, current, clickable prices from online gun stores. At press time, the site features 1,743 handgun pages covering a huge variety of guns from 144 manufacturers; 107 of those pages feature reviews of the latest handguns written by our editor-experts. 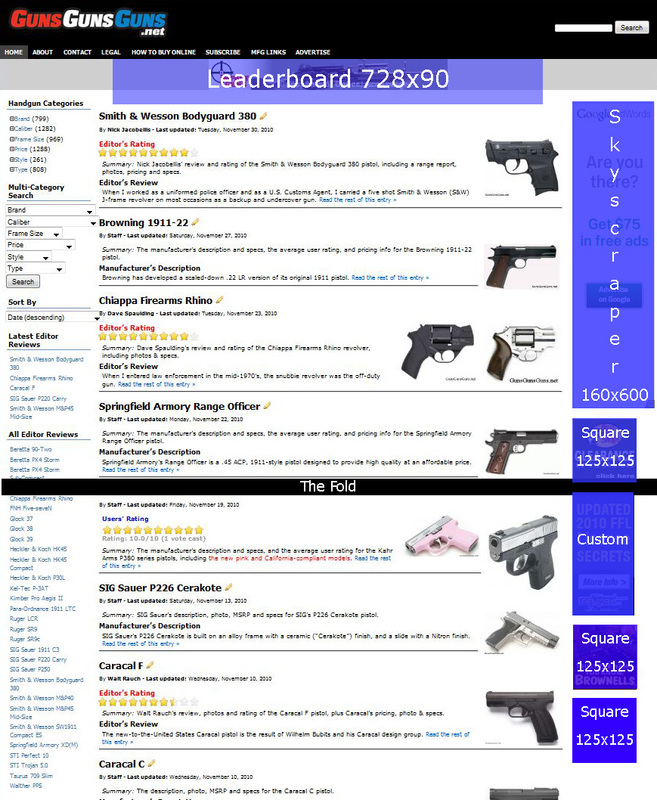 To date, GunsGunsGuns.net remains the only site posting both editor and reader ratings on guns, and the only site displaying current gun prices in the clickable “Buy Now” format. Our site also offers unmatched search and filter tools to help readers find the info they’re looking for. 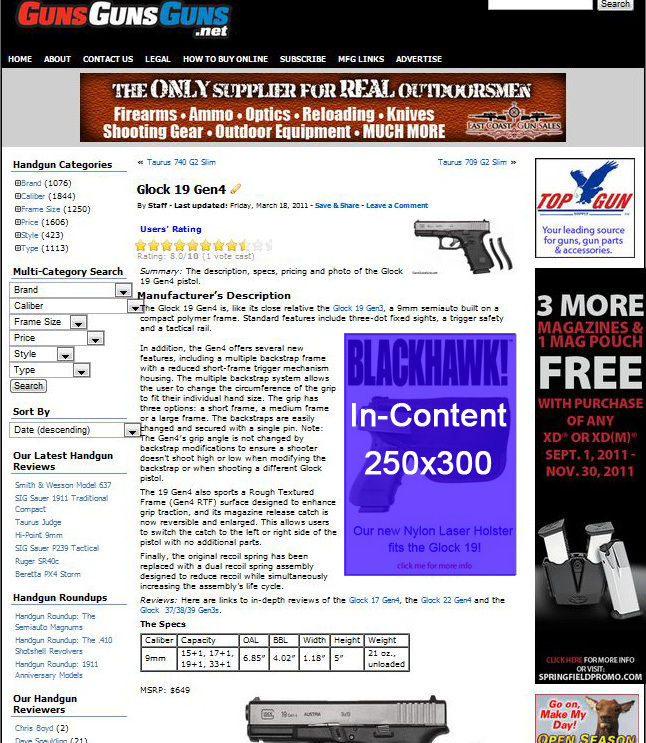 GunsGunsGuns.net offers advertisers excellent value. For starters, consider its reader demographic. Our content attracts a very focused and highly attractive group of folks: shoppers and buyers. And these folks are interested in more than guns; many are also in the market for holsters, sights, optics, lasers, suppressors, lights, eye and ear protection, grips, targets, ammo, handloading equipment and supplies, magazines, mag-loading tools, apparel, training courses and materials, gun cases, gun safes, knives, gun cleaning equipment, gun customization, etc. In addition, our traffic numbers remain strong with roughly 400,000 page views from 225,000 users each year. In 2018, we anticipate even more as we improve our rankings in Google search, continue adding great content (including more of our ever-popular handgun roundups and “best of” lists) and add a killer filtered-search tool. All perimeter ads get run of site. In-content ads are page-specific. We accept static ads in .gif, .jpg and .png file types, animated ads in SWF and Animated Gif file types, and will consider video or audio ads. The maximum file size allowed is 50Kb. We accept third-party ad serving. Finally, in addition to the rate plans listed above, we’re open to exploring other rate plans with you as well, such as CPM, PPC, etc. We also can accommodate many custom ad sizes, and place ads within individual gun pages—check out the ad placement options below. And, we provide monthly impression and click-thru stats for your ads as well. Contact us now to lock in these great deals now regardless of how high our traffic climbs! I am Gabriel with Newsmax Media. I am reaching out in regards to paying your for some real estate on your website. Newsmax Media works with over 2,000 publishers and sites. I am working with sites like yours across the country offering a fixed rate or a CPM to place a 300×250 content box on the site. We currently run content boxes across The Hill, The Chronicle Telegraph, Boston Herald, the entire Gatehouse Network and many more. Do you have some time this week to discuss this opportunity in greater detail? In addition to content boxes we also offer display advertising through our 15+ placements, along with email widgets, email list management and email marketing. I would love to learn more about the sites monthly impressions and more.